With the soul of a race car, the Alfa Romeo Montreal has never been at a loss for admirers. 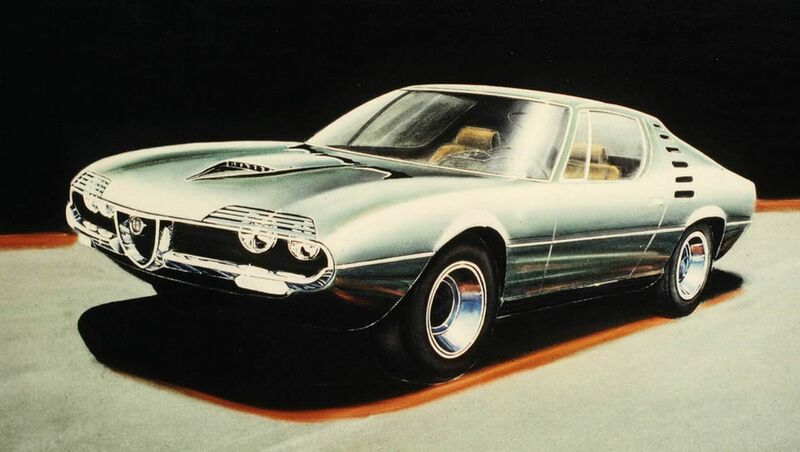 Gandini rendering of the Alfa Romeo Montreal. Of the countless models of automobile built over the last century plus, apparently only one has taken its name from a Canadian city, so it’s only appropriate that on the 50th anniversary of its introduction (and on the 150th anniversary of Canada itself) that the North American Alfa Romeo clubs converge on Montreal for their annual convention. After Moscow backed out of its commitment to host the 1967 world’s fair five years before the event, Montreal took over the event, which it dubbed Expo 67. As David LaChance wrote in Hemmings Sports and Exotic Car #87, November 2012, Expo 67 organizers specifically asked Alfa Romeo to come up with a design that would “express man’s ultimate aspirations in the field of motor cars” and to name it after the host city. Alfa Romeo, in turn, handed off the task to Marcello Gandini at Bertone, who took some Miura elements, some bits from the Alfa Romeo Canguro styling concept, and assorted other inspirations to design a low-slung fastback coupe with partially concealed headlamps. Two prototypes followed, both built on the Giulia Sprint GT chassis and powered by the Giulia TI’s 1.6-liter double-overhead-camshaft four-cylinder. Both made the trans-Atlantic trek for their showcase in the Man the Producer pavilion, but, despite rave reviews from the millions who attended Expo 67, the Alfa Romeo Montreal didn’t go into production right away. “Indecisive management… delayed the transformation of the Montreal prototype to a production car,” Montreal expert Bruce Taylor wrote in Alfa Romeo Montreal: The Essential Companion. Specifically, Alfa Romeo’s management couldn’t decide whether to downsize the Montreal prototypes’ GT dimensions to fit the Giulia engine or adapt a larger engine to fit the prototypes’ dimensions. Fortunately, Alfa Romeo had recently purchased Autodelta and the services of former Ferrari engineer Carlo Chiti, who had just prior to the unveiling of the Montreal prototypes revealed a 90-degree quad-overhead-camshaft alloy V-8 to power the Tipo 33 race car. Alfa Romeo Chief Engineer Orazio Satta thus led the effort to transform the Tipo 33 engine into a production car engine by increasing its capacity from two liters to almost 2.6 liters, fitting it with Spica mechanical fuel injection, and wedging it under the Montreal’s hood. To accommodate the more powerful engine, Satta specified a ZF five-speed transmission, fortified chassis and suspension components, and upgraded four-wheel disc brakes. The body, on the other hand, underwent only minor changes from prototype to production, remaining entirely recognizable when the production version debuted in March 1970 in Geneva. Over the next seven years, Alfa Romeo sold about 3,900 Montreals, according to Taylor’s AlfaMontreal.info, which noted that initial production likely ended around 1974 or 1975, with Iso continuing occasional production for a number of years afterward using the original tooling. While Alfa Romeo sold Montreals around the world, it never officially sold any in the United States. To celebrate the 50th anniversary of the Montreal’s unveiling and of Expo 67, the Alfa Romeo Owners Club and the Alfa Romeo Club of Canada will co-host an international convention in Montreal this year. In addition to tours of the city and the concorso, the convention will also include time trials at a nearby track, an autocross, technical seminars, and a gimmick rally. ALFA expo17 will take place July 13-16. For more information, visit AlfaClub.ca.